Arilyn is an Augmented Reality company focused on delivering the best tools for virtual storytelling. With Arilyn platform the professionals in marketing, media and entertainment can create the ultimate Augmented Reality experiences to engage their target customers to enjoy the wonders of this new media. Arilyn offers both mobile application for enjoying the experience and the back-end portal ArilynManager for professional use. Arilyn mobile application is available for free from AppStore and Google Play. ArilynManager is available for license for B2B customers. ion of the “snapshot” generation. Augmented Reality is the growing in speed to become the next big mass media. Arilyn has special tools that help you tell your brand´s virtual story. 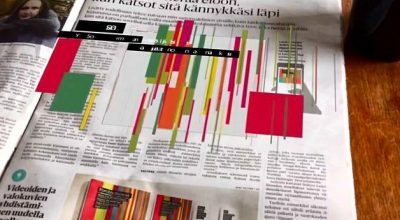 Helsingin Sanomat, the biggest newspaper in Finland, was awarded in February 2017 in a international “Best in Digital Design” competition for this info graph that become alive with Arilyn. For more information please visit www.arilyn.fi or send us an email at contact@arilyn.fi.